A learned monk who flourished in A.D. 420 and whose writings are given by Gallandius, t. ix. in Latin, Vincentius, a monastic presbyter and Ecclesiastical writer in the island of Lérins, he was a man learned in the Holy Scriptures, and well instructed in the knowledge of the doctrines of the Church, with a view to overthrow the sects of the heretics. He composed in elegant and clear language a very powerful dissertation, which, concealing his own name, he entitled Peregrinus against Heretics. Palestinian; was a historian of the Christian church. He composed an Ecclesiastical History in nine books, comprising the period between A.D. 324 and 439. St. Hilary of Arles, then by Salvianus and St. Vincent of Lérins. In A.D. 440, he was elected bishop and took part in the Synods of Orange, Vaison and Arles. He was an accomplished Latin Ecclesiastical writer. A Christian priest and writer of Gaul, who appeared to have a special background in law. He died at Marseilles in 484.
his piety and zeal won for him universal admiration, and his oratory merited for him the name Chrysologus, meaning: golden-worded or golden mouth. Gallo-Roman; a poet, diplomat, and bishop. Also known as Victor of Vite, an African bishop of the province of Byzacena (called Vitensis from his See of Vita); he wrote "The history of persecution of the African province, and Hunirici Geiserici times of the kings of the Vandals". This is mainly a contemporary narrative of the cruelties practised against the orthodox Christians of Northern Africa by the Arian Vandals. Syrian; bishop of Batnas, or Sarug, he was a writer in the Syrian Church, named by one of his biographers "the flute of the Holy Spirit and the harp of the believing church." Bishop of the city of Ruspe, North Africa, in the 5th and 6th century, born into a noble family of Carthage. Bishop for forty years, was the foremost ecclesiastic of his generation in Gaul. In all the Christian West, only Gregory the Great and Gregory of Tours overshadowed him. The was the notary of Ambrose of Milan, and his biographer. In Carthage in 411 he had opposed Caelestius, a Pelagian. The formal proceedings were described by Augustine in On Original Sin. Paulinus set up six theses defining Pelagian views as heresy. His work is the only life of Ambrose based on a contemporary account, "Life of St. Ambrose" and was written at the request of Augustine of Hippo; it is dated to 422. He succeeded Aurelius as bishop of Carthage who is known principally as the author of three letters: an Epistula ad Ephesinam synodum addressed to the Council of Ephesus in 431, an Epistula ad Vitalem et Constantium, and an Epistula ad Theodosium Augustum, which reports the death of St. Augustine of Hippo to the emperor Theodosius. Roman; successor of Pope St. Siricius, who is remembered chiefly for his condemnation of Origenism. A Roman by birth, he became pope in 399, and died within a little less than four years. Among his friends were Augustine, and Jerome, and Paulinus. Jerome speaks of him as a man of great holiness who was rich in his poverty. It was during the time of the barbarian invasions. Greek; pope from 417-418, condemned Pelagianism and other shrew Pelagian authors like Coelestius. of Hippo, who dedicated to him some of his works. Italian; bishop of Turin and theological writer, he assisted at the Council of Milan in 451, and that of Rome in 465. Maximus is believed to have been a native of Rhaetia. Name of a fabricated writer under which he defends Christianity. His real name seems to be Evagrius, who flourished in the late 4th century. St. John Chrysostom; an eyewitness of the martyrdom of Theodotus. Deacon and pope, a Roman in the region of Campania; pope from A.D. 422 to 432, he lived for a while at Milan while actively condemning the Nestorians and Pelagians. He was a zealous defender of orthodoxy. A priest and poet whose principal work was a poem in five books called "Carmen paschale". The first book contains a summary of the Old Testament; the four others a summary of the New Testament. A prose introduction dedicates the work to a priest named Macedonius. A disciple of St. John Chrysostom, he was born in Egypt to a prominent Alexandrian family. He became an ascetic, and moved to a mountain near the city of Pelusium, in the tradition of the Desert Fathers; known to us for his letters, written to Cyril of Alexandria, Theodosius II, and a host of others. His letters display great judgment, precision, and learning. Pope from 432-440, often connected with a great building boom in Rome, he reigned during both the Nestorian and Pelagian controversies. The son of St. Eucherius and the disciple of Salvian. It is doubtful whether he was bishop of Vienne or of Geneva. He was present at the Council of Orange in 444. A friend and disciple of St. John Chrysostom, he was placed on the patriarchal chair of Constantinople in 434. He appears to have been wise, moderate, and conciliatory, desirous, while strictly adhering to Orthodoxy himself, to win over those who differed from him by persuasion rather than force. He is venerated as a saint in the Eastern Orthodox church. Also known as Arnobius the Younger, Christian priest or bishop in Gaul, author of a mystical and allegorical commentary on the Psalms, first published by Erasmus in 1522, and by him attributed to the elder Arnobius. Galilean; Born in Mauritania, a priest and teacher of rhetoric; he is said by Cyprian to have had the famous Caesarius of Arles as one of his students. He wrote five treatises, only one of which, De Vita Contemplativa, has survived. Son of a priest of Cyzicus, he was an Ecclesiastical writer who wrote in the Roman province of Bithynia in Asia Minor about A.D. 475 to prove against the Eutychians, that the Nicene Fathers did not teach Monophysitism. Elected 48th pope of the Church, reigned from A.D. 483-492, born into a Roman senatorial family and was a great-great-grandfather of Pope Gregory I. His repudiation of the Henoticon, an unsuccessful attempt to reconcile the differences between the supporters of the Council of Chalcedon and the miaphysites, is considered the beginning of the Acacian schism. Pope from A.D. 492 until his death in A.D. 496, he was a prolific writer whose style placed him on the cusp between Late Antiquity and the Early Middle Ages. His reign was characterized by a call for strict orthodoxy. he has enjoyed but a slight reputation as a Christian writer. Bishop and theologian of Ancyra, modern day Ankara, flourished about the year 429, attended the Council of Ephesus in 431, during the reign of Byzantine Emperor Theodosius II. 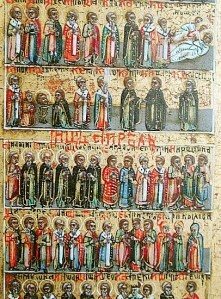 Although he had earlier supported the Nestorian theology of Nestorius, bishop of Constantinople, Theodotus at the council supported Patriarch Cyril of Alexandria in condemning Nestorius. Greek; theological writer and bishop of Cæsarea, known for his commentary on the Book of Revelation which is the oldest Greek patristic commentary on that book of the Bible. He succeeded St. Basil. Byzantine; a Christian abbot, theologian, scholar and ascetical writer; he gave up this life in the political sphere to enter into the monastic life. a polymath whose fields of interest and contribution included law, theology, philosophy, and music.